Yes, most of them are pink colour! Daddy said girl should wear more pink, look cuter. Aren't they look nice and cute? And they were discount after discount clothes!! Daddy mummy said we are so blessed to be able to get nice clothes which such a low price. Daddy can't wait to put these clothes and shoes on me when I am out from mummy's womb! I hope daddy will pamper me more but mummy said has to control daddy. Please mummy!!!! I received more gifts today!!! Uncle Bernard and family gave me some very cute and nice baby clothes and a very cute ducky musical box! I even get me a winter hat, booty and mitten!! Thank you uncle Bernard, auntie Julie, jie jie Rachel and jie jie Carin! 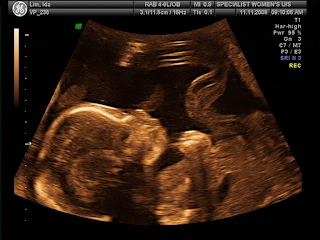 Today daddy mummy went for 19 weeks ultrasound scan to check whether I am growing healthy or not. They were very pleased that doctor Michael told them I am growing very healthy. My heart beat is good, spinal cord growing strongly, brain and every part of my system is developing well as well. I am around 20-22cm now! Daddy mummy thank God for my good health. During the scan daddy mummy saw me sucking my thumb while resting in the womb. I can sense daddy and mummy smilling and feeling very happy when they saw me. Here is the video Dr Michael captured on me....am I cute? 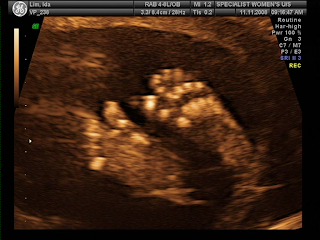 Dr Michael also captured my foot, mummy loves it coz she thinks it is so cute! I know I know you are interested to know whether I am a boy or a girl.....mmm.....Dr Michael finally told daddy mummy that I am a GIRL!!!! It is just what they wish for! Uncle and aunties, if you vote me as a boy, sorry...leave it for my sibling in future ya! For the past few days, daddy mummy received a lot of baby stuffs from uncles and aunties. Auntie Shiela gave me whole bag of used baby clothes. Few days ago, Auntie Rachel passed mummy another big bag of baby clothings, shoes, bips and even photo frames for me!!! Auntie Rachel also lend daddy mummy a very nice bassinet and baby travel carry bag. Auntie Vicky (Auntie Rachel's mum) blessed me with a baby car seat which is just 1 month old!!! This saves daddy mummy a lot to get me a car seat which could cost more than $200-300. I am so so blessed with some many things even before I am born! Auntie Angies and Uncle Andrew even want to bless me with a new baby cot! Daddy mummy said this is indeed a great blessing from God through uncles and aunties. Thank you Auntie Shiela, Auntie Rachel, Uncle Michael, Auntie Vicky, Auntie Angie and Uncle Andrew! Don't you think all these gifts from uncles & aunties are so nice and cute?! !